Categories: Books | Tags: Conan the Conqueror, Robert E. Howard, The Hour of the Dragon | Permalink. I’ll post more about other Conan collections, I think. I grew up reading the Howard/ DeCamp/ Carter Paperbacks (along with the Horseclans books and everything by Michael Moorcock I could find), and while I do prefer the Conan stories as originally written by Howard, those paperbacks, especially the introductions written by (I think) DeCamp, are what really made me fall in love with Sword and Sorcery. I’ve just started going back and picking my way through the pastiches and edited stories, and I’m finding them not as bad as the reputation they have. I grew up with the same stories (I only missed the Horseclans, damn! ), and I liked very much De Camp’s introductions and his tongue-in-cheek attitude. And while no one can write as Howard did, there’s a number of pastiches that are at least pretty decent adventure yarns. Actually, Lancer books picked up Conan and started publishing the series in 1967. 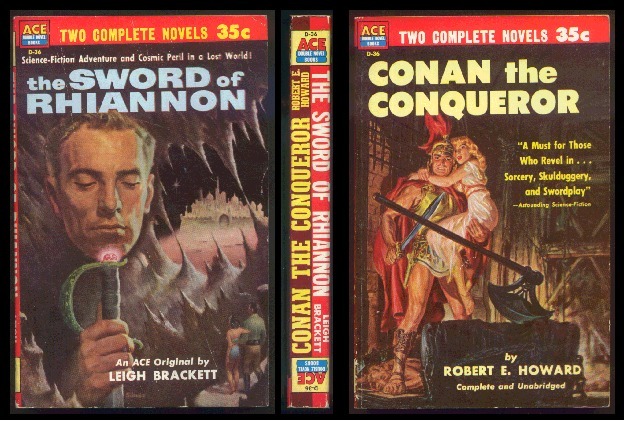 Gnome books published the story as Conan The Conqueror in 1950. Ace books got the rights to publish it under that title from Gnome in 1953 as one of their ACE Double Books with the second novel being The Sword Of Rhiannon by Leigh Brackett. Original cost 35 cents. I found a copy in an old bookstore I used to frequent back in the early 1980’s. It was just sitting on the shelf in the SF/Fantasy section. When I opened it to see how much it was marked for sale I started laughing because the guy in the store had marked for the original cover price of 35 cents!! It’s currently sitting on my REH – Lin Carter – Fritz Lieber shelf in a small plastic protective bag. the real funny part is that it’s a 65 year old paperback and it’s in better shape than most of the ones I have that were published in the 70’s, 80’s, and 90’s. I think it’s my brain that automatically connects De Camp and Lancer. And what a stroke of luck finding that copy for 35 cents! Yeah, but I’d love to find a copy of the Hardcover like the one you have.